In a converted shipping container set in the heart of San Francisco’s Hayes Valley, Smitten Ice Cream serves up old-fashioned ice cream with a twist. The non-traditional ice cream shop makes every scoop of ice cream to order, meaning patrons can look on as their own cup transforms from milk, cream, strawberries, sugar, and salt into a delicious frozen dessert, within a matter of seconds. 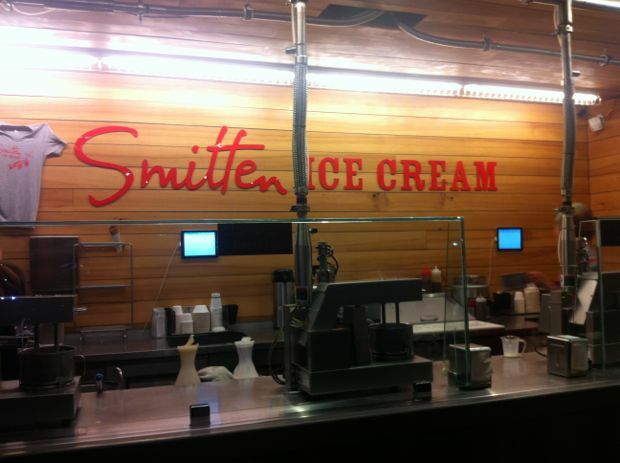 Smitten makes it possible with a specially designed liquid nitrogen mixer that evenly freezes the ingredients at a glacial -320 degrees Fahrenheit. While it may look like a lab experiment gone awry, the process actually serves a purpose other than pure novelty. 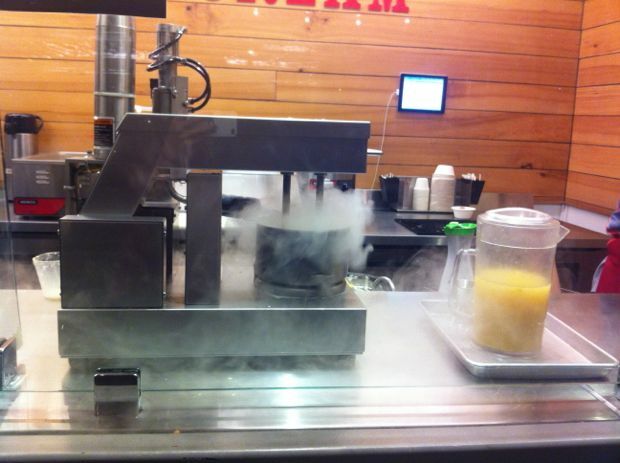 The machine freezes the mixture in very small ice crystals, resulting in an incredibly smooth and creamy end-result. 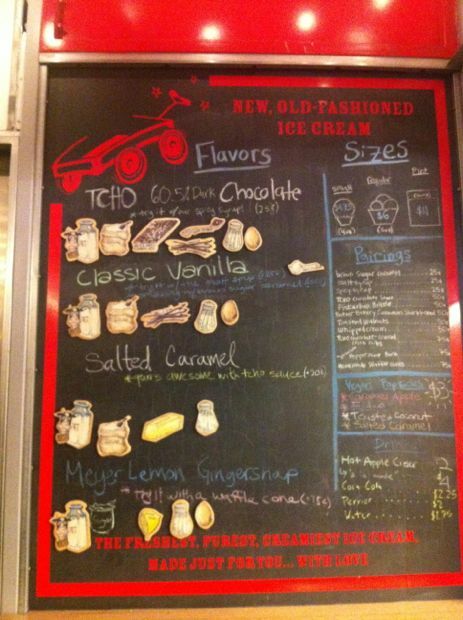 Aside from a fresh take on the process of ice cream making, Smitten is unique in its approach to the flavors and ingredients that go into their desserts. Their simple philosophy seems to be that less is more. On any given day, Smitten carries just four flavors – Vanilla, Tcho Chocolate (a local chocolate maker), and two additional seasonal flavors. Seasonal flavors vary from Meyer Lemon and Gingersnap to Olive Oil with Lavender Shortbread, and a whole host of inventive flavors in between. In making each flavor, Smitten opts to use as few ingredients as possible, most of which are locally sourced from within the Bay Area. Couple inventive flavors with fresh ingredients and a low freezing point, and you have a cup of ice cream bursting with flavor and a perfectly creamy texture. This entry was posted in San Francisco, Taste and tagged Gingersnap, Hayes Valley, Ice Cream, Liquid Nitrogen, Made to order ice cream, Meyer Lemon, Proxy, Proxy Project, Smitten, Smitten Ice Cream, Tcho Chocolate. That’s my favorite too! Never gets old. A girl can never have too much chocolate (ice cream). Smitten is delish! 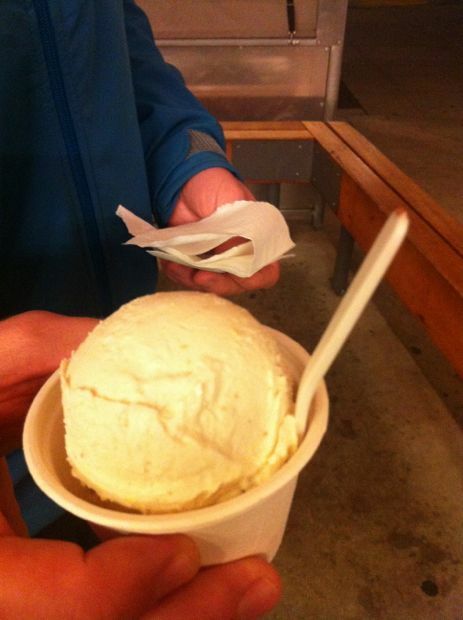 I have a friend who has ice cream from there almost every day… even when it’s chilly out, it’s THAT good. I’ll have to try when I get to SF! Which is actually in about a month…and I’d love to meet all the H&L contributors in the Bay Area.